Perusing Whole Foods makes me a little ambitious, so I splurged on some tuna steaks but decided to keep it simple with how I prepared them. I ended up making a salad that was TOO GOOD not to share. 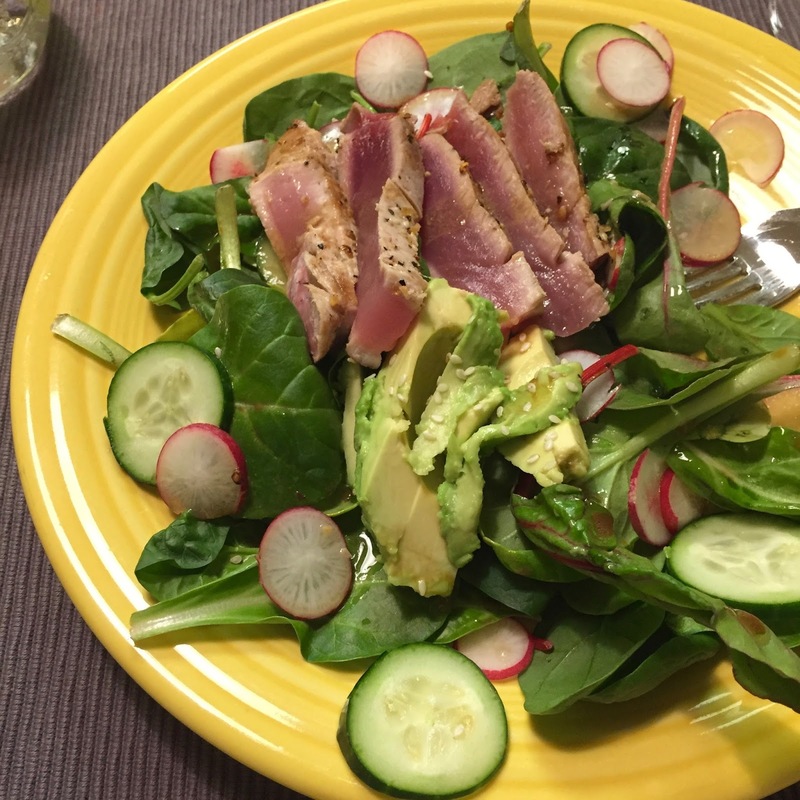 If you score your ahi tuna on sale or even get a previously frozen portion, you can make this incredibly delicious salad (that can serve 4-5) for around $25. 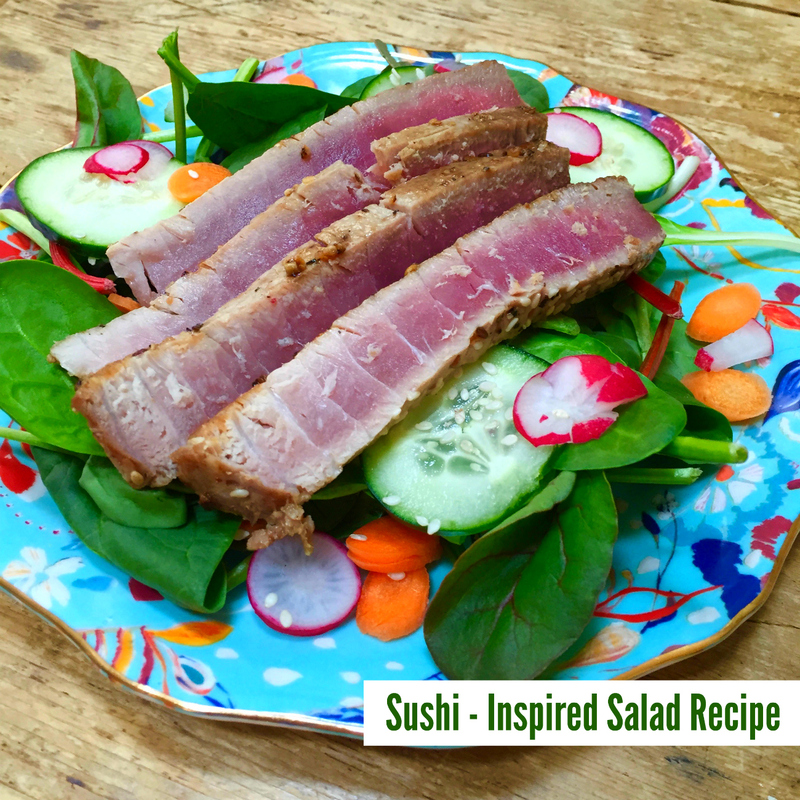 We named it sushi salad because it's fun to say, but feel free to class it up a bit if you make it for friends an call it "tuna steak salad with wasabi soy dressing." 1. Thinly slice cucumber and radishes. Also cube or slice your avocado. 2. Whisk together 1 tbsp soy sauce, 1 tbsp rice vinegar, 1/2 teaspoon (or more) wasabi paste. Set aside and just before serving, whisk in 2 tbsp of olive oil. 3. Heat skillet over medium-high heat and spray with olive oil cooking spray. 4. Drizzle some sesame oil over the tuna steaks and season with montreal seasoning or just salt & freshly ground pepper. When the skillet is heated, toss tuna steaks onto skillet and cook 2 minutes on each side. Let rest before slicing at a diagonal. It should be a deep pink color and the center should be raw, like sushi. 5. Toss dressing with greens or drizzle at the end. Arrange greens, radishes, cucumber, and avocado on plate. Top with sliced tuna steak. Sprinkle with sesame seeds for a little crunch. This looks delicious! I have always been nervous about cooking tuna steaks but maybe I will give it a try! This sushi inspired salad looks delish.But unfortunately I can't eat it as raw fish doesn't suit me and I vomit as soon as I take a bite of raw fish. Yummy, Tuna steak. I always had tuna burgers and never had this as a steak but looking forward to making this dish and will share my results too. The sushi inspired me a lot in the process of fb and got very well after the long process. To made salad with tuna is really yummy to taste. I already check it out.if you want more delicious dish then contact Yandex support here you find all kind of dish which will you need.